Field design is BETA functionality with known usability limitations. Expect to see improvements in future versions. Field design is accessible from the Actions menu within nurseries & trials. Select Make Field Map to get started. The BMS uses the term ‘field’ to represent a large area at a location that is subdivided into blocks of land, where a ‘block’ is part of the field that will be planted in a consistent way. Planting block is the unit that is mapped. Establish the field location, field name, and block name. 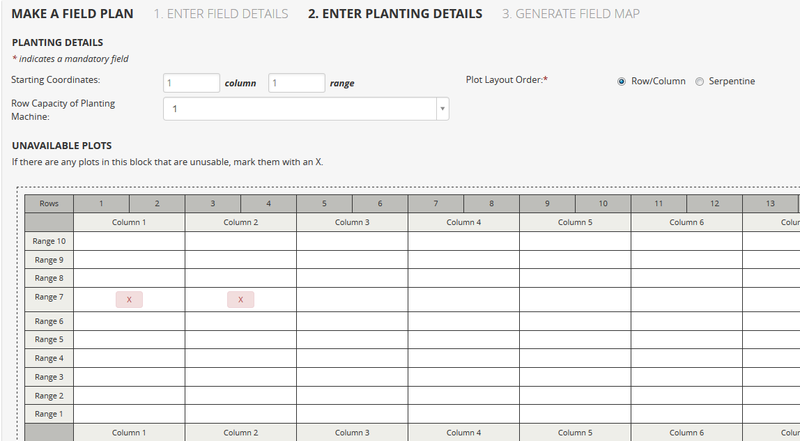 Calculate the number of plots available in the planting block. Enter the number of rows per plot that you will use. Number of rows in the block is the number of plant rows available across the block horizontally. For crops which are not grown in rows, you can enter the number of plots for number of rows and 1 for rows per plot. The number of ranges is the number of plots available across the block vertically. The number of rows must be evenly divisible by the number of rows per plot to give the number of plots across the block. The total number of plots available in the block must equal or exceed the number of plots needed. The field plan is 50 X 10 plots. In this example, we specified 100 rows and 2 rows per plot, so the field plan has 50 columns by the specified 10 ranges. Starting Coordinates: Leave the default starting coordinates for plots set to column 1 and range 1. If you wish to start planting at another position, for example to fill a field that is already partially planted, you can customize the starting coordinates. Plot Layout Order: The Row/Column option will cause the planting order to return to the same side to start each row. The Serpentine option will cause the planting order to run in alternating directions from row to row. Select Row/Colum for the planting order of this field plan. Row Capacity of Planting Machine: Determines how many rows are planted in each direction in one pass of the planting machine, but does not affect the plot layout. Leave this set to 1, which is also a suitable setting if your field will be planted by hand. Unavailable Plots: Specify any plots in the block that are unsuitable for planting. Click on the plot in the block map to generate a red X. For this example, note Column 1/Range 7 and Column 2/Range 7 as non-plantable.? Select Next to generate the field map. The field map shows each plot within the block from the starting position with the trial or nursery name and plot number on the top line and the Entry number on the second line. The option to export the field plan to an Excel file is available under the Actions menu. Review the summary of the field map settings as well as a graphical display. Click finish to save the field map and return to the Manage Nursery view.